The department is divided into five collections according to its many different functions. The first consists of the relevant archives of the Natural History Museum in the strictest sense, above all files such as those belonging to museum directors from the time of the Monarchy, files of later directors, inventories and official correspondence. The second collection consists of bequests from persons who had little or nothing to do with the museum during their lifetime, together with a collection of various letters and manuscripts. The third, a particularly valuable and comprehensive collection, contains original paintings and graphic prints, and is known as the picture collection for short. Historical photographs and glass-plate negatives form the fourth section. All physical objects, from printing blocks, old typewriters and cameras to busts etc. are kept in the fifth collection. The contents of the Department of Archive for the History of Science at the Natural History Museum Vienna are not measured in meters or even kilometers as they are in other archives or libraries, because this is not only an archive in the traditional sense, but also an institution for the history of science, particularly natural science. In 1987 the archives were raised to the status of a department. However, since research in the history of science in the broadest sense is carried out in addition to the custody of the archives themselves, it was renamed Archive for the History of Science in 1998 and in 2002 Department of Archives and History of Science. On December 1, 2009 (Federal Gazette 399. Ordinance on the organization of the NHM) the department's name was changed back to "Archive for the History of Science". 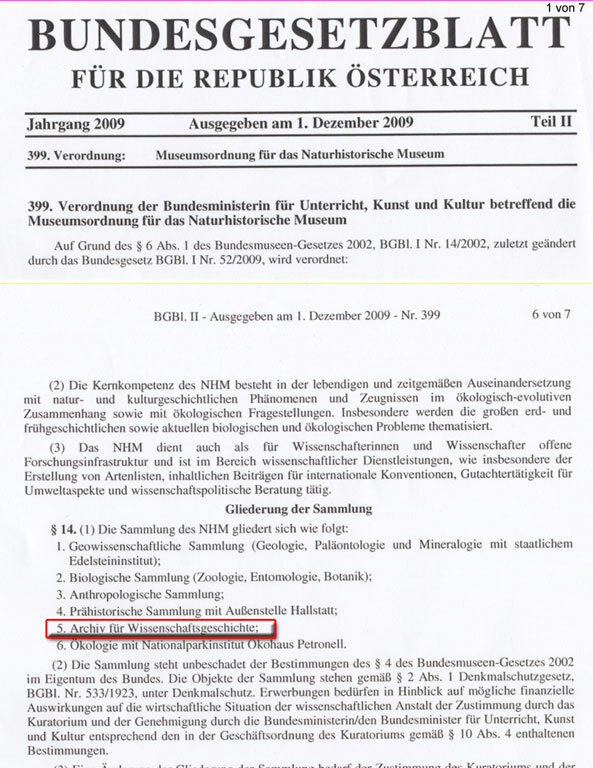 Attached to the Department Archive for the History of Science at the Natural History Museum Vienna is the Department for the Protection of Cultural Assets. After a 30-year period of protection (Federal Archive Act: Article 8, Paragraph 1), objects contained in the archive are available for research purposes. Provisions on data protection and individual privacy must be adhered to.